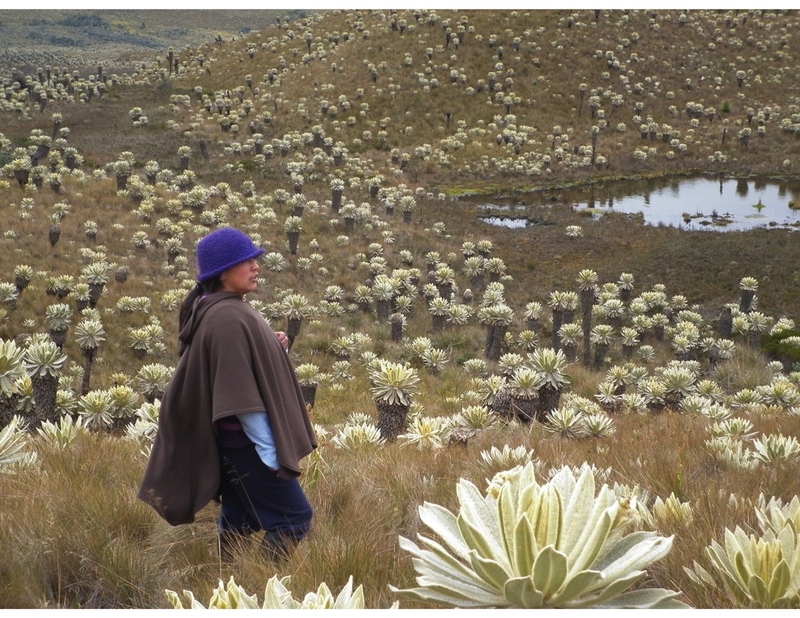 For the Pasto people, the lagoons of their territory are considered sacred spaces. Pasto territory, Cumbal, Colombia. Photo by Ulloa, 2012. Abstract: Climate change (CC) has not only led to environmental transformations, but also to economic, and political responses of various kinds. Such transformations and responses involve gender and ethnicity inequalities unfolding across time and space. In this sense, it is becoming increasingly necessary to carefully analyze the political and cultural dimensions of CC policy, while considering indigenous perspectives on it, thus generating culture-specific strategies to face current climate and environmental transformations. I will discuss how indigenous peoples in Colombia face global and national policies on CC, by positioning their territories as sentient beings, natures as relational, and human and nonhuman beings as political entities, while proposing alternatives to mitigate the effects of climate change based on local knowledge and cultural practices. In brief, I argue that there are ways of thinking about the interactions between humans and nonhumans mediated by social, political, and economic relationships yet informed by relational ontologies. Non-anthropocentric by definition, these ontologies have the potential to open up room to re-think CC policy and legislation, while positioning alternative points of view to mitigate the impacts of CC. The indigenous perspectives are based on knowledge, ways of knowing, and places of knowledge from a situated, and historical, perspective. Climate change (CC) has led not only to environmental transformations, but also to economic, and political responses of various kinds. Such transformations and responses involve gender and ethnicity inequalities unfolding across time and space. Current discussions on CC, and subsequent political and global reactions to it, are centered on mitigation and adaptation issues. Furthermore, they have produced a series of national and local policies and programs with several territorial effects across the globe. Such policies and programs are based on a series of conceptualizations with multiple interpretations, meanings, and political valences. On the one hand, the debate around concepts such as “mitigation” and “adaptation” becomes ever more important given its current implications for policies, plans, and programs at the local level—particularly within indigenous territories (Ulloa 2018). On the other hand, calls from academia, as well as from national and international political arenas, draw attention to a series of conceptions, knowledge practices, and actions around climate variability in specific cultural and territorial contexts. In this sense, it is becoming increasingly necessary to carefully analyze the political and cultural dimensions of CC policy, while considering indigenous perspectives on it, thus generating culture-specific strategies to face current climate and environmental transformations. But it is also important to consider institutional proposals. In this vein, I will discuss how indigenous peoples in Colombia face global and national policies on CC, by positioning their territories as sentient beings, natures as relational, and human and nonhuman beings as political entities, while proposing alternatives to mitigate the effects of climate change based on local knowledge and cultural practices. Climate change transformations introduce new nuances for indigenous peoples and their territories. This text foregrounds the importance of the political and cultural dimensions of CC, as well as of its ensuing environmental transformations. One of the main premises is that cultural responses to climate change express different conceptions of the nonhuman. Furthermore, decision-making agendas around CC hold unequal implications in local contexts. In general, local knowledge, including indigenous conceptions of place and place making, is usually absent from CC policies. Thus, often divergent knowledge systems, subjectivities, identities, and practices in regards to natural life, as well as their specific transformations in particular places, are not situated on equal footing with institutional proposals. It becomes increasingly important to position local knowledge practices in the debate, for different modes of interaction with the nonhuman hold the potential to decenter the predominant anthropocentric stance on global policy on CC, while claiming other ways of seeing the nonhuman. Here it is important to start with a “relational ontologies” perspective, which understands relationships between humans and nonhumans in non-anthropocentric terms. For example, natural elements are actants who establish relationships with humans, that is, beings such as water, mountains, and minerals, among others, have acting capabilities in their own right. Indeed, there is a different approach to nature and climate change whenever it comes to indigenous and local worldviews. In this context, it is necessary to account for those cultural dimensions not affected by economic access, control, and gain, but informed by the logics of reciprocity and mutual dependency between multiple sentient beings. In brief, I argue that there are ways of thinking about the interactions between humans and nonhumans mediated by social, political, and economic relationships, yet informed by relational ontologies. These ontologies are non-anthropocentric by definition, and they have the potential to open up room to re-think CC policy and legislation, while positioning alternative points of view to mitigate the impacts of CC. Indigenous peoples face climate change by positioning their territories as sentient beings, natures as relational, and human and nonhuman beings as political entities. It is necessary to begin by exploring the cultural and political dimensions of indigenous knowledge practices. Indigenous peoples face climate change by positioning their territories as sentient beings, natures as relational, and human and nonhuman beings as political entities. In this text, I will discuss some examples from indigenous peoples in Colombia. We have been working collaboratively with indigenous peoples employing local methodologies (Ulloa et al. 2013). In the course of research experiences with indigenous peoples, there has been a solid dialogue with them over local and public policies, as well as indigenous perspectives on knowledge, knowledge forms, ways of knowing, and places of knowledge from a situated, and historical, stance. Moreover, our work has departed from the analysis of indigenous territorial and environmental perspectives in order to propose an intercultural and interdisciplinary methodological approach to re-think concepts, strategies, and politics of CC (Ulloa et al. 2013). This article has the following structure: in globalocal articulations of climate change policies, I first describe the general context of CC and its interactions with indigenous populations. In the second section, on humans and nonhumans: political and territorial interactions, I discuss indigenous proposals and engagements with environmental change, while highlighting their relationships with the nonhuman world. These relationships are based on indigenous Ancestral Law conceptions and practices and expressed in places, ways of knowing, spaces and words of power, and life practices. I conclude with some final remarks highlighting indigenous perspectives and proposals on climate change. Currently, climate change transformations introduce new nuances for indigenous peoples and their territories. CC entails environmental as well as political, economic, and cultural effects. On the one hand, global policies on CC have entailed actions centered on mitigation and adaptation proposals. These proposals are considered strategies to face climate transformations. Yet, they yield important political implications in part given to their origin in Intergovernmental Panel on Climate Change/IPCC-led mitigation/adaptation proposals, and their specific ways of generating knowledge about nature (Dietz 2013; Ulloa 2011). On the other hand, these policies have recently opened space for indigenous participation in political arenas and scenarios of trans-nationalization and globalization of nature, as well as the incorporation of green markets and environmental services by means of commodifying of the global climate. The emergence of CC has also created a climate eco-governmentality (Ulloa 2010, 2011, 2017) articulated to specific representations of nature, citizenship, and geo-politics of knowledge. In this context, nature is deemed a global commodity. This term also signals new articulations between the local, the national, and the global, while reconfiguring the relationships between CC policies and indigenous territories at large. Furthermore, these representations entail a geo-politics of knowledge centered on global powers that, again, expand a universalizing vision of knowledge in which neither indigenous peoples nor women are included. Theses global scenarios become a forum for mitigation and adaptation strategies. However, they do not seem to open up room for discussion with local communities. Relations with the nonhuman are based on Ancestral Law, ways of knowing, place of knowing, with words and places of power and life-practices at large. In this context, relationships with nonhumans are erased while notions of a carbonized nature and a zero-carbon citizen take their place. Carbonized nature implies fragmentation and commodification of nature to enable its inclusion in carbon markets, and the emergence of a zero-carbon citizen, implies new subjectivity and identity related to "a citizen deterritorialized, neutral, and culturally homogeneous, without ethnic, class, or gender difference" (Ulloa 2017, 115). According to these notions, a zero-carbon citizen manipulates a carbonized nature through new valuation of nature within global carbon markets. Indigenous peoples have demanded recognition of their own ways of thinking about climate and environmental change in the face of these new articulations. These ways of thinking and acting are based on their conceptions of the territory, nonhuman, autonomy, and environmental self-determination, as well as their own life practices. Indigenous cultural, territorial, and environmental conceptions consider “territories-natures” as a central component of any political proposal. In the current wave of the globalization of nature, for instance, indigenous peoples propose local control of their natural resources, but also the re-conceptualization of the notion of resource itself. This proposal includes a mode of control over indigenous territories and resources following alternative notions and visions of nature, knowledge, and politics—for instance, an indigenous territoriality includes diverse scales both horizontally and vertically. These processes involve local territorially-based politics that conceptualise the territory as a process of cultural and political relationality, where it is considered a living entity with agentive and social capacities in its own right (see also de Sousa Santos 2010, Escobar 2015). Such conceptions of territoriality depart from an idea of natural relationality that supersedes the relationship with the territory and the soil, while involving other dimensions (spatial, physical, symbolic and daily life). These perspectives of territoriality also consider notions of the fixed and the mobile (extensions, discontinuities, continuities) projected upon several scales (body-territory-nationality). Moreover, they establish a relationship between the body and the territory involving cultural dimensions of specific places such as a sense of belonging, identity making, and the experience of emotions. In other words, the making of the territory expresses local constructions of a geographical self (the imbrication of being, doing, feeling in/with the territory), as well as local decision-making, political organisation, and mobilisation associated with places and/or sites of symbolic, political, and cultural relevance. Furthermore, these local constructs of the geographic-self include dimensions and relations of horizontal and vertical territoriality bringing about the territorial control of several aspects of life: spiritual, symbolic, material, cultural, environmental, and political. Thus, indigenous peoples propose a cultural and territorial politics based upon notions and practices of autonomy and territorial self-determination (Ulloa 2018, 227). Relationships between humans and nonhumans are a key element to understanding the human positionality in dealings with the nonhuman world. In this context, the notion of materiality holds different connotations. For instance, mineral, trees, and other beings are deemed as living entities in certain communities; they are actants in constant transformation. This relationality takes place in the territory as well as in the bodies of all beings that inhabit it. Yet, the kind of vertical and horizontal geopolitics of indigenous peoples coupled with their conceptions of territoriality determine the kind of relations that interconnect living beings in particular places. Indigenous people’s relationships with nonhumans articulate notions of territoriality. Indigenous people’s relationships with nonhumans articulate notions of territoriality, as well as cultural practices responding to specific and localized notions of nature. Such relationships are determined by the principle of reciprocity between humans and nonhumans — taken as relatives — while also mediating human and nonhuman rights, and decision-making processes at the individual and collective level. These rights and processes articulate several cultural and territorial dimensions that include local representations and classifications of life, as well as gender-specific practices in particular contexts. In this sense, it becomes ever more important to re-think human/nonhuman relationships in order to include them in current categorizations of environmental change, thus impacting CC policy-making processes and agendas. Indeed, most understandings of the nonhuman world ignore local environmental change, but also the place of environmental policy in local contexts. Therefore, it is urgent to evaluate the possibility of a nonhuman agency according to local meanings where the defense of life and the principle of environmental self-determination are grounded in cultural norms. The governability of territories and all beings entails repositioning cultural governability (Zambrano 2001), political autonomy, and environmental self-determination in national contexts. The principle of cultural governability is important in indigenous proposals of autonomy that are grounded in practices of territorial order, local environmental management, and food sovereignty. Indeed, cultural governability picks up on cultural practices that are specific to each indigenous context. According to the Law of Origin, the territory is sacred and we ought to act within it by following the Law, so the autonomy, and self-governability of the territories can be guaranteed. This entails the recognition of indigenous peoples as environmental authorities in their own right, as well as the guardians of their own territories-natures. Yet it involves indigenous food sovereignty according to local principles of environmental self-determination, and against the pressures of dominant territorial models that have fragmented and/or erased local ecological knowledges and food practices. Thus, there have been several proposals to protect local seeds and production practices as a way to resist the imposition of these models, recuperate cultural principles, and reposition indigenous peoples as environmental authorities. The principles underpinning the Law of Origin become core elements of indigenous thinking and practice as well as the base to understand and propose political and cultural actions outside their communities. Several indigenous peoples claim the recognition of their Law of Origin, in particular, when it comes to CC policy. In fact, climate policy cannot be an imposition from the outside, but an expression of cultural processes grounded in local ways of producing knowledge and the places where this knowledge may flourish. Processes of knowledge production among indigenous peoples are linked to specific sites. There, different concepts and practices associated with these processes can circulate. Some of the sites allow the production and transmission of knowledge according to gender-specific relationships. Moreover, in such places, there are complex interactions between the intergenerational transmission of knowledge and the emergence of new knowledge. Even more, in the processes of producing knowledge necessarily arise from the interaction among humans and nonhumans. Once relationships with nonhumans linked to weather are established, cultural ways of interpreting climate stability and change emerge—that is, local ways of knowing. Situated conceptions, perceptions, and representations over weather are based upon the knowledge of meteorological factors, atmospheric conditions, and their effects on different beings (i.e., flora and fauna). Such an imbrication between climate and local perceptions of atmospheric conditions organizes a complex knowledge system. To be sure, this system emerges from the relationships between humans and nonhumans in specific places, but also between the cultural memory of previous experiences, and the actualization of daily life experiences and observations. Knowledge about nature and weather are expressed as cultural indicators, namely, signs found in different aspects of the elements of the environment (size, color, the rhythms of emergence of certain phenomena and natural elements, among others) that require cultural interpretations. Cultural indicators are far more complex and subtle because they are centered on changing interactions between human and nonhuman beings; nevertheless, by knowing these cultural indicators, it would be possible to infer unknown and perhaps more precise indicators in order to improve CC global policies, as well as to include other ways of understanding and thinking about weather in general and in climate change in particular. Each culture has its own decision-making sites. These places are socially constructed, and they host decisions of cultural and symbolic relevance for each community. They are also known as sacred places, places of power with the utmost importance in the context of environmental conflicts. In fact, decision-making over human-nonhuman relations takes place in such spaces as well. For indigenous people, lagoons, mountains, stones, or specific trees are considered spiritual sites and spaces of power insofar as memory and knowledge—as well as relationships with the nonhuman world—become activated through ritual practices (Puenayán 2014). Place of power and sites of knowledge are associated with specific words, called words of power, which involve a series of specialized and precise knowledges and practices. Such words also articulate different representations about the relationships between humans, nonhumans, and the territory they all inhabit and co-create. Both, words-power and representations, join together two elements: “knowledge forms” and “forms of life” (beings) that inhabit and constantly co-create the territory. On the other hand, these territories are given names through specific words that activate and effect those beings in place. Thus, name-making happens in place and by means of symbolic and everyday engagements with the world. Indigenous peoples have likened the aforementioned aspects to life practices, that is, local modes of constructing different worlds based on human-human and human-nonhuman relationships. For indigenous peoples, for instance, the minga or community work exemplifies this notion of life practices. The minga is a collective activity that implies the use of ancestral knowledge in order to protect the territory, for example protecting the water. Responses to Climate Change are grounded in sociocultural proposals. In Colombia, there are a multiplicity of cultural perspectives around climate change that imply different responses to environmental transformations. Many of those responses to CC are grounded in sociocultural proposals that arise from indigenous relationships between humans, nonhumans, and territories. Moreover, these cultural understandings of life, as well as local responses to CC, foster knowledge dialogues that are sustained based on a different relationship with local territories-natures. Responses to Climate Change are grounded in sociocultural proposals. On the one hand, the previous examples make evident the impossibility of creating national policies of CC (mitigation and adaptation) without considering political and cultural variables. On the other hand, we see that each culture has specific notions of what they consider to be the sources of climate change and that they act according to these conceptions. Yet, these responses do not always agree with international and national actions on CC. In this context, it is clear that we ought to articulate two dimensions of the problem: the politics of climate change, and local knowledge and strategies related to climate variability. The first deals with the political dimension of climate change, and therefore, with the issue of adaptation. The second process or dimension has to do with cultural factors. The aim here is to account for other ways of producing environmental knowledge in the case of indigenous peoples. The articulation of these two processes suggests a new way of understanding mitigation and adaptation strategies within global climate change policies, which require both conceptual and practical rethinking and re-elaboration of concepts and practices. In other words, it will ask us to imagine cultural and political strategies to manage environmental and climate transformations. These strategies include indigenous knowledge in relation to specific sites and their historical transformations. Dietz, Kristina. 2013. "Hacia una teoría crítica de vulnerabilidad y adaptación: aportes para una reconceptualización desde la ecología política." In Culturas, conocimientos, políticas y ciudadanías en torno al cambio climático, edited by Astrid Ulloa and Andrea Prieto-Rozo. Bogotá: Universidad Nacional de Colombia / Colciencias. Puenayán, Zonia. 2013. "Mingambis: minga de percepciones y concepciones propias de los indígenas pastos, sobre tiempo y clima, resguardo Panan, Cumbal (Nariño, Colombia)." In Culturas, conocimientos, políticas y ciudadanías en torno al cambio climático, edited by Astrid Ulloa and Andrea Prieto-Rozo. Bogotá: Universidad Nacional de Colombia / Colciencias. Ulloa, Astrid. 2010. "Geopolíticas del cambio climático." Anthropos 227: 133–-146. Ulloa, Astrid. 2011. "Autonomie indigène et politiques globales du changement climatique: repenser la relation avec la nature dans la Sierra Nevada de Santa Marta, Colombie." In Le multiculturalisme «au concret»: Un modèle latino- américain?, edited by Christian Gros and David Dumoulin Kervran. París: Presses Sorbonne Nouvelle. Ulloa, Astrid. et ál. 2013. “Informe final proyecto Perspectivas Culturales y Locales sobre el Clima en Colombia.” Bogotá: Universidad Nacional de Colombi–Colciencias. Unpublished manuscipt. Ulloa, Astrid. 2014. "Estrategias culturales y políticas de manejo de las transformaciones ambientales y climáticas en Colombia." In: Sabiduría y adaptación: El valor del conocimiento tradicional en la adaptación al cambiocClimático en América del Sur, edited by Lara Rommel and Roberto Vides-Almonacid. Quito: UICN. Ulloa, Astrid. 2017. "Geopolitics of Carbonized Nature and the Zero Carbon Citizen." South Atlantic Quarterly 116 (1): 111–120. Ulloa, Astrid. 2018. "Reconfiguring climate change adaptation policy: indigenous peoples’ strategies and policies for managing environmental transformations in Colombia." In: A Critical Approach to Climate Change Adaptation: Discourses, Policies and Practices. Edited by Silja Klepp and Libertad Chavez-Rodriguez. Series: Routledge Advances in Climate Change Research. Pp. 222–237. Zambrano, Carlos. 2001. "Territorios plurales, cambio sociopolítico y gobernabilidad cultural." In Territorio y cultura: Territorios de conflicto y cambio sociocultural, edited by Beatriz Nates. Manizales: Universidad de Caldas.